Feelings of home, simplicity, kindness and being open to new and crazy ideas are the things that best characterize today’s “Tonika”. 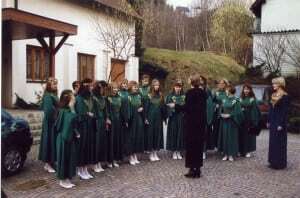 Chamber choir „Tonika” once was founded as an ensemble. 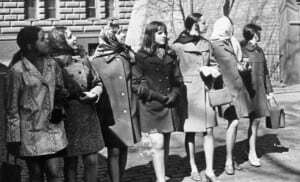 Its dawn was at autumn 1966, when, going to annual concert tour around Latvia, Riga Pupils Palace folkdance ensemble „Uguntina”as a try-out asks to rich concert, filling the changing pauses, to the conductor Daumants Kaktins with a small staff of choir „Riga”. Surprisingly, performance with 8 people succeeds very well, and moreover, as Kaktins later admits – staff that is so small is very convenient to transport. Later another few concerts take place and the idea of founding a choir occurs. Participants name it ‘Tonika’. Tonic is the basis of every musical scale, that which determines its shade, moreover, tonic, mediant and dominant (first, third and fifth degree of scale) are consistent. The quality of ensemble „Tonika” is equally consistent. 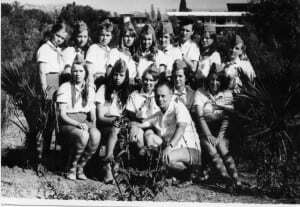 From the very beginning – in the middle of 60’s – artistic level was high, as evidenced by the first place at the international child festival ‘Baltic sea – sea of peace”, as well as the obtained rights to participate at the popular pioneer camp of USSR ‘Artek’. The 70’s is the time when „Tonikas” builds up its image and conquers its place among other musical collectives of Latvia. The most significant achievements of this decade are the 1st degree diploma at All-union review in Moscow at 1971, as well as the victory at the vocal competition ‘What can you do?’ held by Latvian Television in 1979. This competition has a big effect on making „Tonika” popular in the years to come. Moreover, 70’s is the era of Imants Kalnins. With the music of Kalnins and a touch of romance that fits teenagers so much, theatricalized concerts are being directed in the late 70’s. Especially beloved are his songs ‘Where have you been, world?’ from rock opera ‘Hey you there!’, ‘Shark’s song’ from the play ‘The Prince and the Pauper’ and ‘Song, how do you start? ’, which later becomes the choir’s hymn. To join the choir you must meet certain requirements, the participants change often, but with strictness, determination and regular work Kaktins obtains a level slowly approaching to that of a professional ensemble. All USSR and DDR is visited, also concerts in Latvia are given actively. The 80’s is a very exciting time in the history of “Tonika” The choir is founded due to the singers’ wishes to participate at the Song and Dance Festival. The new ‘choir’ succeeds straight away – it wins out the first places two times in turn at 1980 and 1985 Latvian Song Festival reviews. Parallel to this, as far as year 1989, ensemble continues its pinnacle of glory at musical TV concourse “What can you do?” of Latvian Television, Department of Education of Latvian Soviet Socialistic republic, Latvian Soviet Composer Union and Riga Pioneer Palace. Thank to the popularity of this concourse collective became very recognizable. The 80’s undeniably is a time, when chamber music works of great classical music composers are being included in ‘Tonikas’ repertory. Although the popular music parallel to the classical music has always taken an important place in choirs’ – ensembles’ repertory, performance of romanticism compositions, that needs a bigger choirs’ stuff, for example, is not possible until then. From the classics especially often ‘Tonika’ sings Bach, Haydn and Mozart. What is interesting is that ‘Tonika’ performs also instrumental compositions that are transposed to voice. Great changes for ‘Tonika’ that is officially a choir now starts in the 90’s. Not only the political and economical situation in the country changes. Gradually the time of conductors’ substitution comes – ends the period of Kaktins and Kristine Jaunalksnetakes his place. In the new conditions a new opportunities arise, for example, opportunity to travel to West, as well as release of a CD; that happens in 1999. This is a time when a feverish time slice of journeys and concourses starts: Spain, France, Italy, Northern countries and Germany. 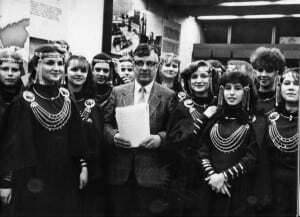 participation at Europe’s cantata projects in the season of 1999. In the 90’s choir is in the turn of the century, when former work has to be looked through and new specific features have to be found. Also the new conductress has to find her own way. Over all dominates willing to confirm yourself, being together and real singing festivity. Year 2000 in the life of ‘Tonika’ is fateful. Once again there is a change of conductors and really short time when Marika Austruma is ‘Tonikas’ conductress. Starting from a year 2002 choirs’ art director is Inga Cimina. This is a beginning of a new era in the history of„Tonika”. Beside the basis of the choir which is love of music and high musical level, a lot of new things occur in the life of the choir. One of the main aspects is diversification of programs – down to 5 different concert programs in one season –not only sacred, classical and Latvian music programs among them, but also transcriptions of popular foreign light music and jazz music. Furthermore, each concert is being made as a unique item in which frequently even the sequence of compositions plays a big role in uncovering the idea or leading motive of the concert. 1st and 2nd place in sacred music concourse in Daugavpils (2007). „Tonika” continues to delight the audience with its ability to sing not only in foreign counties, but also at home in Latvia. A special new tradition is choir’s summer camps that take place in a different city each year. In these camps „Tonikas” girls can acknowledge themselves in many different ways – at singing, dancing, sport, drawing and formation, besides that these camps give a great opportunity for girls to get to know each other better. Especially exciting is staging of the musical plays or musicals. A new tradition for choir is dancing, including several dance numbers in the concerts.